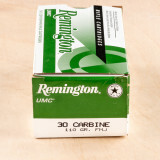 The .30 Carbine cartridge is popular with both rifle and pistol shooters. 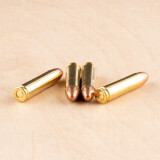 This widely used military classic caliber is a great round for target shooting and plinking at the range. 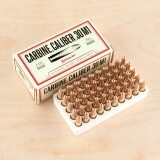 30 carbine ammo is a classic military caliber that's typically used for target shooting nowadays. The .30 Carbine was widely used during World War II in the M1 Carbine for which it was designed. Since then, a number of revolvers from Taurus, Thompson Center, and Ruger have also been produced in this caliber. 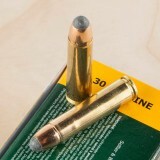 The .30 Carbine's ballistics have been compared to those of a magnum pistol, albeit with a light bullet (typically 110 grains) fired at higher muzzle velocities in the 2,000 feet per second range. Small game hunters will find that .30 Carbine hunting loads can be had from Magtech, Corbon, and other companies; Hornady even makes a variant of its Critical Defense line for those who wish to use this cartridge for home protection that you'll often find in-stock and for sale here at Widener's. 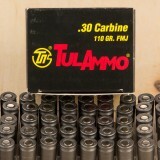 Run your authentic or replica M1, M2, or M3 Carbine inexpensively with this .30 Carbine caliber ammunition from Tula Cartridge Works. 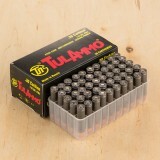 Tula ammo comes from the Tula Plant in Russia and is regarded as dependable and cheap. As the oldest Russian ammunition plant, Tula-made ammo has over 125 years of experience backing it up for consistency and quality that you can trust. This ammo is ensured to retain its characteristics from -4 degrees Fahrenheit to 122 degree Fahrenheit. 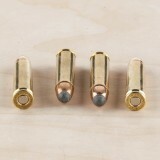 This ammunition is assembled using non-corrosive Berdan primers fitted into steel casings. The steel casings are straight-walled and coated with phosphate polymer in order to provide proper fit and chamber seal during the firing. This prevents excess carbon fouling from being blown back into the action and causing stoppage to correct function and cycling. 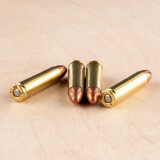 The cartridges are topped with 110 grain full metal jacket bullets just like the original American-made WWII-era rounds. They also leave the muzzle at 1,990 feet per second just like the original meaning this ammo is a match for traditional ballistic tables and usable in homage-style matches. 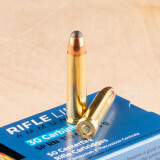 You’ll have high-quality ammo that cycles smoothly and delivers reliable accuracy when you select this Tula 30 carbine ammo. The 110-grain bullet will come out of the barrel with a muzzle speed of 1,990 feet per second, giving you precision on medium range shots. The full metal jacket will deliver less barrel fouling, allowing you to maintain accuracy throughout your time at the range. 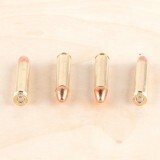 This package is for a single box containing 50 rounds of ammunition. Tula is a handgun and rifle ammunition company that has been serving the needs of gun owners with high-quality cartridges for many different calibers. They specialize in training and target-shooting ammunition and also create primers and other reloading supplies. Dating all the way back to the 1940’s, the .30 Carbine is a light, effective rifle round that has been used for military purposes and civilian target shooting. It maintains excellent trajectories, speed, and velocity, making it a favorite among range shooters and competition marksmen. 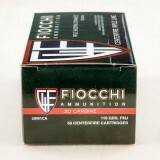 If you need .30 Carbine ammo for the gun range, order a few of these 50-round boxes. This bulk case of .30 Carbine ammo is the perfect companion for your refinished or remade M1 carbine both on deer hunts and on flat ranges. 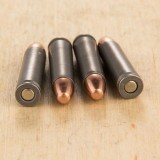 Each of these rounds uses a 110-grain soft point bullet which is similar in weight and shape to the original ammunition issued to US troops; this ensures manageable recoil, smooth feeding, and dependable capability out to intermediate distances whether you choose to use the original iron sights or a modern red dot sight. When traveling through a small boar, medium-sized deer, or uninvited human attacker, the bullet's exposed lead nose will cause to expand outwardly, tumbling as a creates a large, free-bleeding wound cavity before expending its energy in vital areas. In effect, the bullet is more adept at ending threats and dropping game than the standard FMJ load. Prvi Partizan, a Serbian company, has manufactured quality ammo since its inception in 1928. 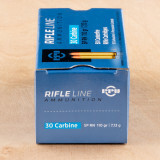 If you are looking for a low recoil round that is incredibly fun to shoot, the 30 Carbine is perfect for you. Developed to replace soldiers' pistols in the back of the line as their side arm right before World War Two, the 30 Carbine is a great, reliable round for all your plinking and hunting needs. With its significant power, great accuracy, and low recoil, you will be shooting this round for ages at the range or taking down delicious, big game. 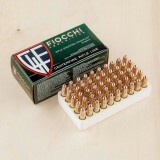 Fiocchi has been around since 1876 and makes some of the best firearms and ammunition in the world. Still owned and run by the same family that founded it, Fiocchi pours their heart and soul into each product made, insuring its incredible quality. With these 110 grain, full metal jacket boat tail, Fiocchi Shooting Dynamics, brass cased, boxer primed rounds, firing at 1990 feet per second, you have the highly dependable, incredibly accurate rounds with fantastic trajectory you need for super range training. The M1 carbine is the weapon that started it all with its compact size, semi-automatic performance, and ballistic capability which are all mirrored in our ARs today. Keep your authentic or replica M1 running rightly with these .30 Carbine rounds from Prvi Partizan, a Serbian manufacturer with close to nine decades of experience under its belt. The company has a reputation for good components, strict inspection standards, and keeping older, more obscure calibers alive with zero dip in quality. 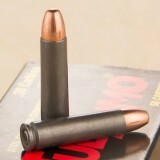 These rounds feature 110-grain full metal jacket (FMJ) projectiles with round noses to match the original load developed by Winchester and used by the U.S. military in World War II and Korea. That makes this ammunition an ideal choice for range practice, plinking, and legacy match usage. 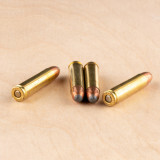 Prvi loads the bullet into a reloadable brass casing that can be de-primed, tumbled, and then reloaded after expenditure. Each case is equipped with a clean-igniting Boxer primer and modern propellant that is free of corrosive elements. This lengthens time between cleanings, lessens wear, and helps overall accuracy over time. 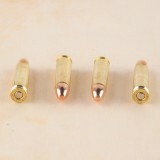 This component choice also visits less wear upon your bore which is amply important to preserving historical firearms. Place your M1 Carbine into the home defense role or take it out for a weekend hunting trip with these soft point .30 Carbine loads from Prvi Partizan. Prvi is a Serbian manufacturer that maintains a wide range of stock for exotic calibers, including some antique American loads. In this case, they gave this ammo a much-needed soft point bullet for an upgrade in terminal effect. 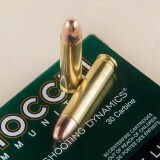 The expansion these rounds exhibit make bigger wound cavities in coyotes, deer, in home-invaders while sending a greater force to the vital organs. 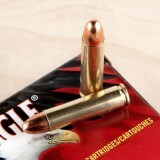 This is achieved because the softer lead tip is designed to expand during target entry. At 110 grains, the round matches traditional .30 Carbine ammo for reliable cycling and recoil that is consistent with range ammo. An overall rounded projectile ensures that the round will feed cleanly in original rifles as well as reproduction tributes. 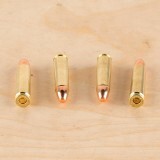 Each bullet is crimped into a reloadable brass casing that is equipped with a non-caustic Boxer primer. This .30 Carbine ammo from Sellier & Bellot delivers great performance against a variety of game using an expanding soft point bullet. 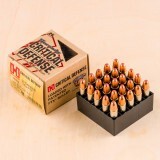 Put your M1 Carbine to work with a few of these 50-round boxes! 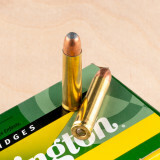 Each cartridge fires a 110 grain projectile that produces typical external ballistics for this caliber. 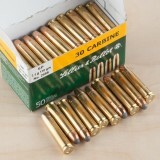 Sellier & Bellot ammo uses non-corrosive Boxer primers and reloadable brass cases. It is loaded in the Czech Republic. 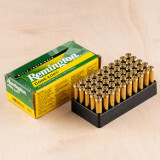 As the oldest weapons and ammunition manufacturer in America, Remington has a fantastic reputation. For over 200 years, Remington has supplied rifles, handguns, shotguns, and ammunition and remains the biggest shotgun manufacturer in America. In addition, they are the only company to make both weapons and ammunition in the States. In the 1940's, when it first came to the market, the M1 Carbine and its round, the 30 Carbine, were meant to give a more accurate alternative for the troops at the back of the line during World War Two. In addition, it was about half the weight of the M1 Garand and Thompson machine gun, making it much easier to wield. 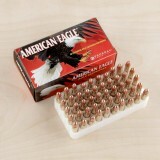 If you are looking for a great round for a great weapon, pick up this 50 round box of 110 grain, metal case, reloadable, 30 Carbine rounds and get to shooting! 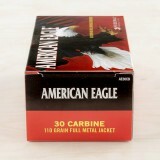 Grab a few boxes of this US-made .30 Carbine ammunition from Federal's American Eagle series. 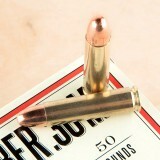 This ammunition doesn't cost much and shoots straight--it's the best of both worlds! 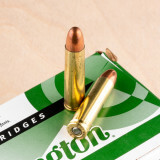 Each round in this box of 50 fires a 110 grain full metal jacket bullet at 1,990 feet per second; this is typical for the caliber and produces good medium-range accuracy. 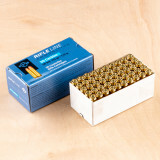 This ammo is made in Anoka, Minnesota and uses reloadable brass cases and non-corrosive primers. 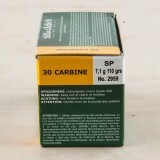 This .30 Carbine ammunition is an excellent range load that delivers accurate fire at a reasonable price. 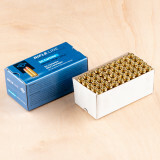 Each cartridge in this box of 50 fires a 110 grain full metal jacket bullet at 2,000 feet per second, producing typical ballistics for the caliber and good short to medium range performance. 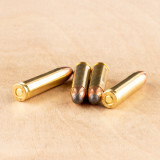 These rounds are loaded by Hornady in Grand Island, Nebraska using non-corrosive Boxer primers and reloadable brass cases. 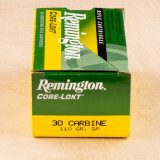 Although associated primarily for the M1 carbine for which it was designed, the .30 Carbine cartridge is also used in a variety of other firearms including the Ruger Blackhawk, Taurus Raging Thirty, and even a variant of the AR-15 from Olympic Arms. 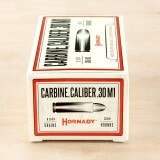 Hornady was founded in 1949 and produces some of the most innovative and effective ammunition in America. 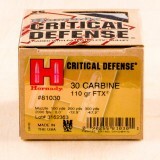 These 30 Carbine rounds from the Critical Defense line are a great choice for your M1 Carbine or other 30 Carbine firearm. Firing at 2000 feet per second, these cartridges feature 110 grain FTX (Flex Tip) projectiles that offer excellent terminal performance. 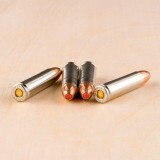 You can expect reliable expansion and consistent penetration with these rounds for self defense applications. 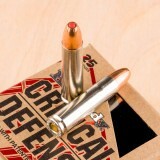 Hornady's Critical Defense line utilizes premium nickel-plated brass cases and non-corrosive boxer primers for added reliability. The 30 Carbine has been around since World War Two when it was invented to give soldiers at the back of the battle line a more accurate round with farther range than the regularly issued sidearm. 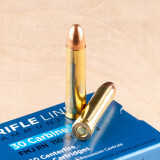 Today, the 30 Carbine is an incredibly fun round to shoot with little recoil and fantastic power, making it great for hunting, self defense, and training at the range. Since 1816, Remington has created some of America's best ammunition and firearms and remains the oldest guns and ammo manufacturer in the United States. 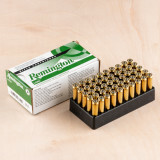 These Remington Express, 110 grain, brass cased, boxer primed, soft point rounds fire at 1990 feet per second, flying with great accuracy and hitting with fantastic expansion, perfect for helping you take out deer on your next hunting trip.